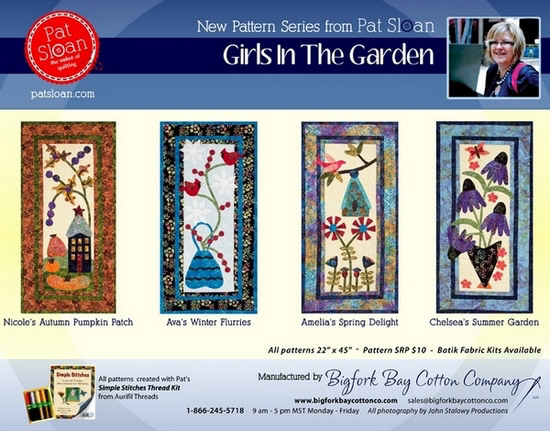 Starting Tuesday, five designers will be sharing their fabric choices for making one of Pat Sloan’s Girls in the Garden patterns. There will be give-aways from Pat and each of the designers too. Plus our friends at the Fat Quarter Shop are giving away FIVE full sets of Pat’s patterns. You can visit the Jolly Jabber blog to enter now. Tuesday, Feb. 21: Michele of Quilting Gallery – that’s ME! 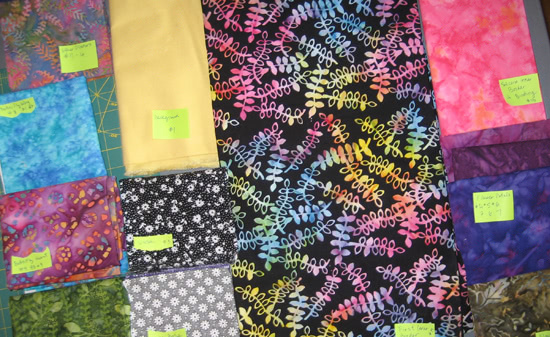 Here’s a sneak peek at my fabric choices. See you on Tuesday as I show what pattern I chose to make, how I used these fabrics and my give-away. looks like fun! Can’t wait to see what you came up with! this looks like fun. I’ll be sure to tune in.